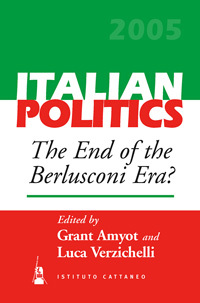 BERGHAHN BOOKS : The End Of The Berlusconi Era? The End of the Berlusconi Era? While Italian politics may appear on the surface to be evolving towards a Westminster model with right- and left-wing blocs alternating in power, this impression is belied by the often nervous and disconnected way in which events unfolded in 2005. In some respects, 2005 was a classic pre-electoral year, in which the pattern of 2000 repeated itself with the roles of government and opposition reversed: the center-left coalition scored a decisive victory in the regional elections in April, provoking a crisis that ended Silvio Berlusconi’s second government, the longest-serving cabinet since the foundation of the Republic in 1948. Berlusconi was able to quickly form a new government, and went on to reform the electoral system in a way that would give him the maximum advantage in the 2006 general election, and to introduce a series of policy initiatives geared more to his own re-election than to real reform. However, while the center-right majority was able to hold together and the center-left was strengthened by its electoral victories and the astonishing success of the primaries held to choose Romano Prodi as its candidate for prime minister, conflict and divisions persisted within both coalitions, leaving the prospect of the development of a stable bipolar system in Italy still in doubt. Grant Amyot is a Professor in the Department of Political Studies, Queen’s University, Kingston, Canada. He has recently published Business, the State, and Economic Policy: the Case of Italy (Routledge, 2004). Luca Verzichelli is Associate Professor in the Faculty of Political Science of the University of Siena, where he teaches Italian politics and public policy analysis. His recent publications include L’Europa in Italia: Elites, opinione pubblica e decisioni, co-edited with Maurizio Cotta and Pierangelo Isernia) (Il Mulino, 2005) and Il parlamento: Le assemblee legislative nelle democrazie contemporanee, with Alfio Mastropaolo (Laterza 2006).